I’m getting ready to start the eighth week of my internship (is that even possible?). Time has really flown by! I’ll try to give you the best rundown that I can. First of all… I’ve been going to Capitol Hill Baptist Church. I LOVE it!!! The services are a bit different than what I’m used to. CHBC services tend to be a little on the long side, but they are packed full of amazing content. The sermons are always Scripturally based and doctrinally sound. Worship consists of responsive reading, prayer and singing. The music tends to be a lot more traditional than I’m used to. 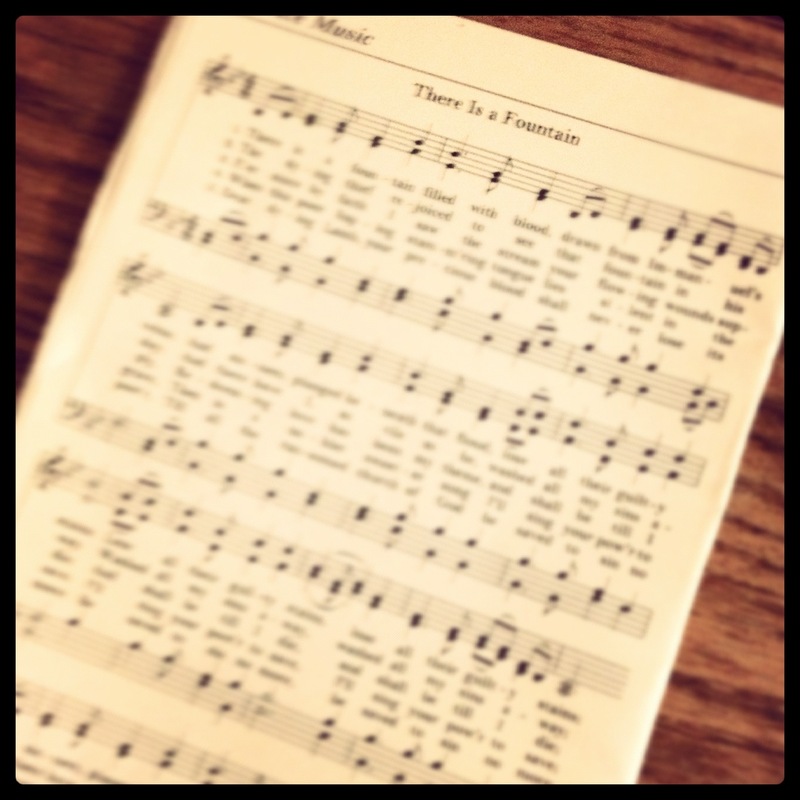 We sing hymns and use sheet music. No power point. No flashy lights. No electric guitar. Just worship flowing from the hearts of hundreds of people of varying walks of life—politicians, construction workers, students, Hill staffers, journalists… I love that the music that we sing is so rich and encouraging. The prayer in service is probably the most distinct thing about CHBC’s Sunday morning services. Any church can sing traditional songs and read Scripture corporately—but I have never heard a church pray like CHBC prays. Every week, they pray for our nation’s leaders, pastors of other churches and individual members of their church. There is set aside time to pray for forgiveness and time to praise God through prayer. The other thing that I love about CHBC is their intern Bible Study. Every week, about 10 interns from various organizations meet with several CHBC members. We read the Bible and pray together. They encourage us to live Gospel-centered lives (both by what they say and how they live out their lives). Before I left for Washington, D.C., I told Kelley that I really hoped that when this semester was all said and done, the thing that I would miss the most would be whatever church that I ended up getting plugged into. Honestly though, I didn’t really think that was possible. While I love my churches at home and school, I don’t know that I can say that I’ve truly felt “at home” in a church in a long time—but now I can. CHBC has been such a blessing. I can honestly say that Tuesday nights and Sunday mornings are my favorite times of the week. I’ve had a birthday since I last wrote. I have officially made it to the exciting age of 22—no longer in the carefree era of teenager-dom, the newfound freedoms of being 21 have lost their novelty and I’m not quite a real adult yet. 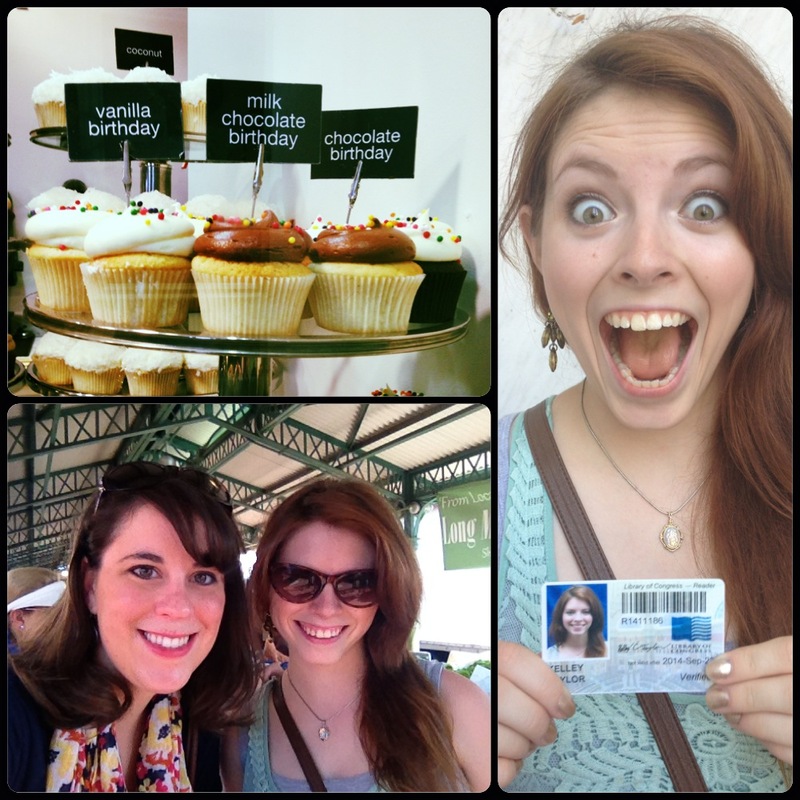 But despite it not being an incredibly exciting age, I DID have an incredibly exciting birthday. My best friend came up to D.C. for the weekend and we had a blast. Kelley got here late Friday night. I had cooked a homemade dinner, and we ate it on the roof of the Dellenback overlooking the city and the Capitol building. We hung out for a while, then we went to bed. We were both really tired and we had a ton of stuff planned for Saturday. Saturday, we walked to Eastern Market and perused through the vendors’ tents and farmers’ stands. We admired tomatoes, jewelry, art and cowboy boots (I’m still kicking myself for not trying any of them on). Next, we went to the Library of Congress, so Kelley could get her Library of Congress reader’s card. After that, we took the metro to Metro Center and walked around the heart of D.C. We saw the F.B.I. building, Warner Theater and the National Press Building (where my internship is). We also stopped in a shop and I fell in love with beautiful, blue dress and I bought it. We took the metro back to Union Station and had really yummy chicken salad and gelato. We walked around Union Station for a while, then we realized we were going to have to book it to get to our next destination. We made it to the Barracks Row/D.C. State Fair about an hour before it closed, and it was a bust! Now, I understand that North Carolina has one of the largest ten day agricultural fairs in the nation and that I’m spoiled, but there was neither agriculture nor carnival rides. THEY DIDN’T EVEN HAVE COTTON CANDY (or caramel apples)!!! To make it worse, it was on Barracks row and there weren’t even any cute marines around! Lame, right? They did have some pretty cool acrobats, but other than that, there wasn’t much to see. After the “fair,” we went to Georgetown for cupcakes at Georgetown Cupcake. We waited in line for about 30 minutes to get in, but it was worth the wait! I got a chocolate birthday cupcake (appropriate, right?) and Kelley got a coconut cupcake. They were both absolutely delicious (and they had a pink, sparkly Kitchen aid mixer… can you say, “I want!”?)! When we got back to the Dellenback, Kelley and I got dressed up as quickly as we could (I wore my new, blue, sparkly dress) and headed to the roof for a mocktail party, where we chatted with WJC and ASPers for a bit. When we got tired of socializing, we watched movies until the wee hours of the morning. Sunday was pretty chill… Kelley left early/mid-afternoon, which was incredibly sad. I’m so glad she got to come. I had so much fun with my forever friend. My internship has been an incredible learning experience. It’s been an opportunity to grow and be stretched. Some days are slow, and other days are packed full of excitement. Some weeks I have 2 or three things published, other weeks, there’s nothing at all. Learning that every day isn’t going to be something to write home about, has probably been the biggest thing for me. My first week was so successful, the lull that hit after was discouraging, but Lauren and Kevin have both been really encouraging. That being said, I have done some really cool things. I wrote about an article featured in National Geographic exposing religious influence on the illegal ivory trade, I’ve tried (in vain) to get in touch with Christian hip-hop artist Lecrae, and talked to a former pro-baseball player (totally by chance). 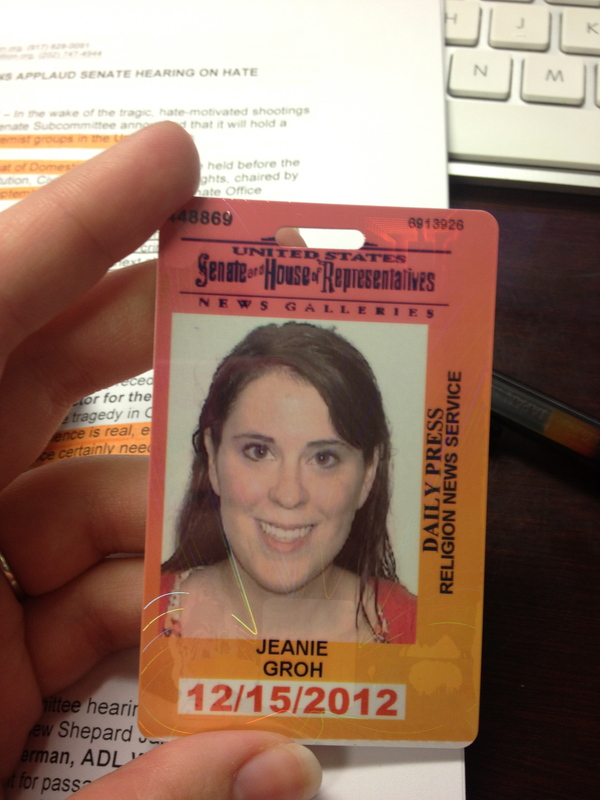 I also got my congressional press pass. It’s probably my most prized possession that I’ve acquired this semester. Now, I’m not wanting to sound vain, but I normally take really good ID pictures, but if you look at the picture, you might notice that I look like a hot mess! Well, I had a 2 o’clock deadline on my story that day, so I rushed down to the Corner Bakery in my building after I finished writing it and rushed to the bus stop. I didn’t get a chance to eat before the bus got there and I knew I wouldn’t be able to take it into the Capitol building, so I decided to scarf it down once I got off the bus. It was extremely windy, and the sky looked like it was about to pour—and pour it did. I barely had enough time to get my umbrella out before the heavens opened up! The wind was so strong that I had to throw away the rest of my lunch because I couldn’t hold my umbrella upright and hold my Panini at the same time. I made my way towards the Capitol building as quickly as I could through the pouring rain, when a particularly strong gust of wind hit me and brought a wall of water with it and knocked me smack dab in the back. By the time I made it to the Capitol building I was drenched from head to toe, but it made for a good conversation starter though. While I was there, I got to take the subway under the Capitol building and I got to see the press gallery—most importantly though, I got my press pass. Wow, it’s getting really late and this post is getting really long. I’m going to call it a night and hopefully get you caught the rest of the way up later this week (perhaps tomorrow?). Stay tuned for a road trip, the North Carolina State Fair (it was a Bumper Crop of Fun), bus day and a slightly rekindled passion (pah! ).